Those anticipating a sea change to the exterior would be disappointed to know that Renault hasn’t fiddled much with the Duster’s design. Yes, the purposeful-looking stance is still there though what’s new for this 2016 model is some garnishing to the bits that matter. The square-ish headlights, for instance, are a lot busier now and feature multiple sharp creases and the front bumper, too, is equally refreshed with dollops of brushed silver cladding. 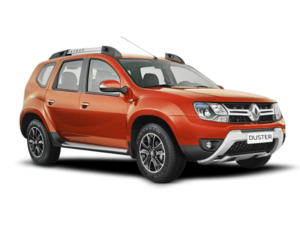 Never is a major facelift complete without a newer set of alloy wheels and for the Duster, Renault has opted for a 5-spoke blacked-out design that seems to have been inspired from those good old die-cast models from Hot Wheels. The new Duster also gets chunky-looking roof rails, different wing mirrors and a revised taillight cluster with funky detailing. While these new taillights retain the basic shape of the old units, they do look rather nice when lit up. Rounding off the changes, there’s a new colour option as seen on the car here. Called Cayenne orange, this shade really brings out the taut and beefy lines of the Duster. Though Renault has made improvements over the years, the Duster’s cabin has always come across as a bit utilitarian. That feeling has reduced, though still not completely gone, thanks to a fresh round of upgrades on this facelifted version. For starters, the new black and chocolate-brown plastics help cover up the rougher edges better than the lighter tones of the earlier Duster. You’ll also notice more silver highlights and a bit more chrome detailing (on the air-con vents, for instance) that help spruce up the cabin. The centre console also gets a lot more gloss-black plastic. On the whole quality has improved, but it’s still not at Hyundai levels. The facelifted Duster also gets embossed branding atop the glovebox, but only those very familiar with the earlier Duster’s cabin will note that the layout of the centre console has been slightly revised. The buttons for the hazard lights and door lock now sit higher up and are more convenient to access. On a related note, the mirror controls that were formerly under the handbrake have been moved to the more traditional position near the window switches, which is more practical. However, the cruise control switches are still scattered between the dash and steering, and the steering column-mounted audio controllers continue to remain out of view. The cumbersome driver’s seat height adjust is also something that should have been improved. The seats themselves are trimmed in richer fabrics and the front pair get armrests for added comfort. Ride quality of the Duster is also a big plus. The monocoque construction, the rigid chassis and a good match in the 215/65 R16 tyres give the Duster confident handling characteristics on the highway and winding hill roads. The suspension set up includes anti-roll bars at the front and the rear. Though very bad roads momentarily seem to leave the Duster a bit unsettled, the suspension does an excellent job of soaking up most of the challenges that regular roads throw at it. Some amount of road and wind noise seeped into the cabin in the RxL variant I was driving, but that could be a one-off. The noise was absent in the RxZ variant I drove later and I am also told by Renault engineers that considerable work has been done on insulating the cabin.